Today was my last day in Los Angeles and my last day overseas (for this holiday). I had to check out of my hotel and had to get my luggage to the airport and I definitely didn't want to miss this flight, but I didn't want to totally waste the day either. I was considering using public transport to have a bit of a day trip somewhere, but as I already knew, Los Angeles public transport is horrible and basically non-existent - this has been confirmed for me by all the hotels I have asked, all the friends I have asked, and by complete strangers as well. I took my luggage to the airport, who did not have any lockers because of "September 11" but luckily someone checked in my luggage so I did not have to carry it around all day. I was a free man for a few hours, so I got a bus to the beach area (a rare bus route that I did know existed). I wanted to go for a long walk along the beach, so I dropped in to the Hotel California and asked if they could mind my day-pack for me ... they kindly said yes, even when they knew I was not staying with them ... they were really nice - if you are wondering if this is the hotel that the famous song was written about, well, probably ... the writer will not admit it ... but there are only two hotel's that it could be, and this is probably the one. 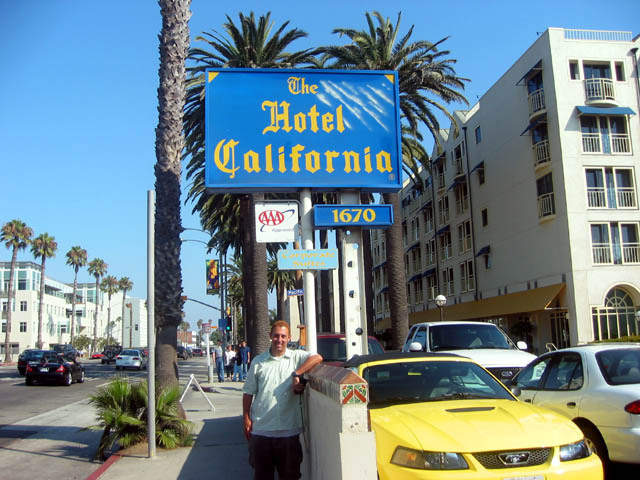 I went for a walk from Santa Monica Beach to Venice Beach to Muscle Beach (all connected). 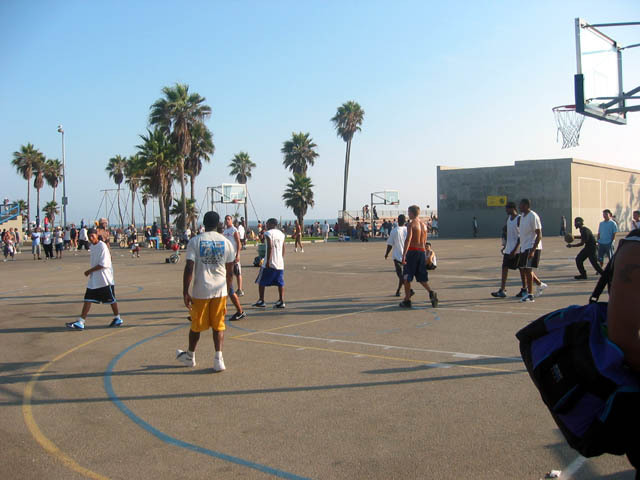 I got to see the site of many movies, including the basketball area that was used in "White Men Can't Jump". There were plenty of interesting shops and good street performers. 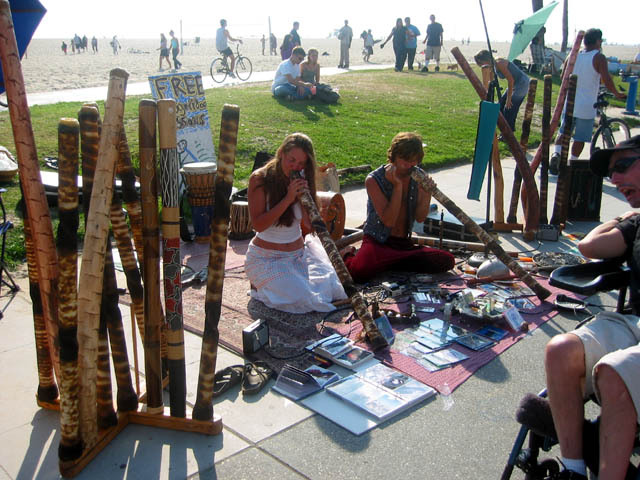 In particular, I saw some people playing didgeridoos - imagine this ... I travelled half way across the world and what do I see - people playing didgeridoos. Also worth mentioning was this dog that sat on the second story of a building catching a ball that people from the street would throw to him ... it doesn't sound like much, but it was funny to watch. 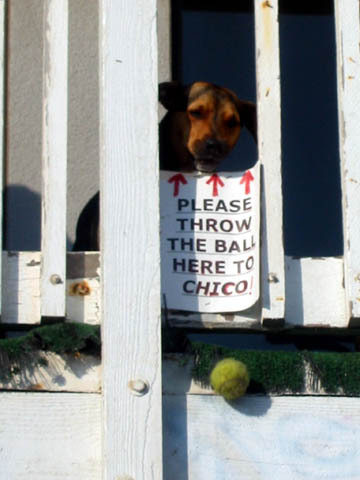 The dog was better at catching the ball than people were at throwing it.